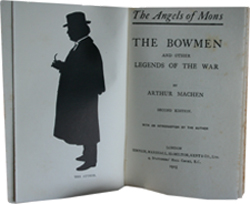 In September 1914, two months after the outbreak of the Great War, Welsh journalist and author Arthur Machen published a short story called The Bowmen in the London Evening News. It describes how phantom archers from the Battle of Agincourt had come to the rescue of British soldiers fighting against the Germans in the Battle of Mons a month earlier. The story was not labeled as fiction and the author soon became to receive enquiries from readers asking for verification of these ghostly archers, who had apparently been summoned by Saint George, the patron saint of England. It appears Machen had no desire to create a hoax, but that the British public, just starting to grasp the full horrors of World War One’s mechanized warfare and its heavy death toll, was ready to believe that a ghostly miracle had occurred in France. Rumors were followed by more rumors and fiction started to become fact in the minds of some Britons. Machen’s story took on a life of its own. Spiritualist magazine wrote about the ghostly bowmen while some people took the story of the angel archers as a sign that God was on Britain’s side. In 1914, Machen published a book in order to put the record straight. In the preface of The Bowmen, he states that the story is fiction. The book became a bestseller, but the public belief in the story became stronger and more reports of angels on the battlefields started to appear. The foreword of The Bowmen is a lengthy examination of why certain people believed the story was true. Machen’s exasperation is obvious and he attempts to explain how rumors begin. Reading between Machen’s lines, the key theme is really religion, which was still a very strong aspect of British life in 1914 and Britons wanted, expected even, miracles. According to the general public distanced from the fighting, the British were good and the Germans were evil, so there would be miracles to save the most righteous ones. After the foreword, The Bowmen tale, which is very short, is recounted and then followed by more of Machen’s war-themed short stories. The author paints a very dark picture of the Germans and continues to play on the belief that spirits are appearing on battlefields. His final story sees the Greek heroes from Troy visit the trenches of Gallipoli. The Angels of Mons (available in print on demand) is perhaps one of the greatest examples of where people will believe what they want to believe. As it became obvious that there would be no quick victory in this war and that thousands of young men were destined in die in the mud of Flanders, there was clearly an appetite for anything that offered hope. The military and the Government had no desire to quash the rumor because it was a morale booster. Today, myths are even easier to create because misinformation disseminates so rapidly via the digital world of blogs, Twitter and Facebook. Reports of celebrity deaths are common place after a single person starts an online chain reaction. Perhaps the oddest thing is the bowmen story never fully faded into obscurity. Magazines have regularly aired the story over the years and the Christian community has been particularly fond of reviving the legend. As late as 2001, the Sunday Times newspaper reported that photographic evidence had been discovered revealing the existence of the angels but its story was disproved as a hoax. Machen was a skilled horror and ghost story writer. The Great God Pan, published in 1894, is considered to be a masterpiece of gothic horror writing. A year later, he published The Three Impostors where a series of tales were interwoven. His novel, The Secret Glory, features the Holy Grail in a modern setting – a theme used by Dan Brown in The Da Vinci Code and George Lucas in his Indiana Jones movies. Machen was also instrumental in developing the theories behind psychogeography, which explores how the landscape influences the mind. H. P. Lovecraft recognized Machen’s writing ability in an essay called Supernatural Horror in Literature and described him as one of four “modern masters of supernatural horror” along with Algernon Blackwood, Lord Dunsany, and M. R. James. Machen wrote three volumes of autobiography - Far Off Things (1922), Things Near and Far (1923) and The London Adventure (1924). There are also three biographies of Machen by Mark Valentine, Wesley Sweetser and the Aidan Reynolds and William Charlton version from 1964. Although Machen was a writer of significance for around three decades, he spent his many of his final years living in poverty. Today, he still has supporters - the Friends of Arthur Machen is a non-profit society dedicated to promoting his work.